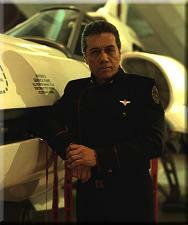 Commander Adama, a war hero and the commander of the Galactica, leads humanity's survivors during the ultimate fight between man and machine. He was on the verge of retirement after years spent in the peacetime military. He is estranged from his son Lee, who blames Adama for the death of his brother Zak, and is a loner who knows well the burden of command. He is a straightforward, insightful leader who makes gut decisions and wears a simple day uniform with a minimum of insignia. When the Cylons attacked, they wiped out virtually all humanity, leaving Adama in charge of Colonial defenses. He is eager to avenge the death of billions. With some reluctance, he is convinced to abandon the last colony and to transport humanity’s remnants to a distant star system, away from the murderous Cylons. It is from the helm of his outdated ship that he tries to lead the Galactica’s fugitive fleet back to their legendary, possibly nonexistent, home world known as Earth.